In preparation for whatever cold I had managed to catch I packed myself a few Halls Vitamin C drops, 4 Benedryl Cold & Sinus and a ton of tissues. Based alone on the 5 hour bus ride to Skopje this appeared to be a smart move on my part, since I can’t even tell you how many times I sneezed let alone blew my nose. Charles and I sat in the back of the Matpoo Bus (you know where the cool kids sit) and became friends quickly with Alex, a Bulgarian Navel Officer from Varna who was on his way to Skopje for a trance music concert. When we arrived in Skopje it was raining, but luckily we arrived just in time to catch the next van/bus headed to Ohrid our final destination for the day. 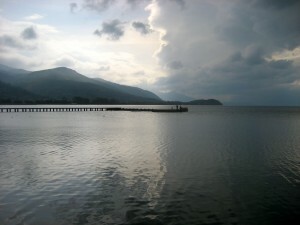 This was another 3 hour journey across Macedonia to the City of Ohrid, which is known for its beautiful lake that borders Albania. We arrived at nightfall and were dropped in the center of town. It was raining and we were hungry so we hurried inside the first restaurant we saw. The staff spoke very little English, but were able to explain to us that the menus were only in Macedonian – so we were directed to the counter and the waiter ushered at us to choose a type of meat to be prepared. When I saw a full baked pig was brought in and placed on the table beside us for a larger group – I was glad I made the decision to get chicken. There is just something wrong about eating an animal that still has its head & eyes intact (something often done in the Balkans). I’m sure all my vegetarian friends are semi gawking at me right now. After dinner we found a cab to take us to the Sunny Lakes Hostel in Old Town Ohrid. I was semi excited, because I realized I was able to use my limited Bulgarian to communicate with the cab driver. The Macedonian language is basically the same as Bulgarian – its kind of like the difference between Spanish in Spain vs. Spanish spoken in Guatemala, Mexico or Puerto Rico. Since it was the off season the hostel was fairly empty; just 2 British backpackers, including our new friend Andy. That night we chilled and watched a football match and “Pretty Woman” on TV! Our host Gyoko provided us with some of his friend’s grandfather’s homemade wine – which was quite delicious. It also worked fast and caused me to pass out at a fairly early hour – which I needed. 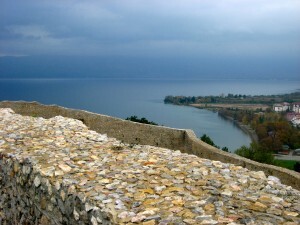 I had set my alarm to go off at 8:45am so that we had some time to explore Lake Ohrid and Samuel’s Castle before we would need to catch a bus to Sveti Naum Monastery near the Albanian border. But, it just so happens that I forgot to take into account a few very important things. The first being that there is a one hour time difference between Macedonia and Bulgaria and secondly it was Daylight Savings Time. So after grabbing breakfast and enjoying the view of Lake Ohrid from the hostel balcony we were informed that we had actually woken up at 6:45am (Ackkkk!) and it was not 10am as we thought, but only 8am. It was a blessing in disguise, because it gave us plenty of time to walk up with our Brit friend Andy to see Samuel’s Castle at the top of the hill in Old Town. When we got back to the Hostel our wonderful Host Gyoko offered to take us down into town to show us where to catch the 11am bus. Gyoko is honestly one of the nicest and best hostel hosts ever, and funnily enough a huge supporter of G.W. Bush. 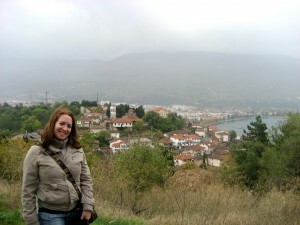 In fact, as he explained most Macedonians are fans because life was best for them under G.W. And here I was thinking that the majority of Europe hated Bush. 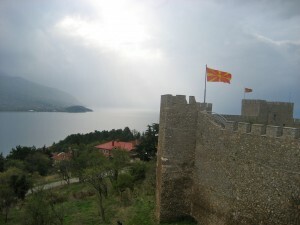 According to Gyoko a lot of aid was given during Bush’s two terms as well as the fact that one of the U.S. Embassies was moved from Thessaloniki, Greece to Skopje, Macedonia. There is a huge rivalry/feud between Greeks and Macedonians and this gave them a sense of pride. He also shared with us a story about the time Bush came to the Balkans and was in Tirana, Albania. Supposedly, when Bush was walking down a rope line and shaking hands with Albanians who came to see him an elderly woman swiped the watch right off his wrist. And Gyoko said it was caught on video and should be up on youtube. So when I got home I decided look for it – and alas here it is, but as it turns out the watch wasn’t stolen after all. According to video coverage by the media, President Bush took the watch off and placed it in his pocket. Anyways, we ended up not talking the bus and instead paid a bit extra for a car to drive us to the Sveti Naum Monastery. We ended up saving a ton of time since the bus would have taken an hour and we got there in 20 minutes. 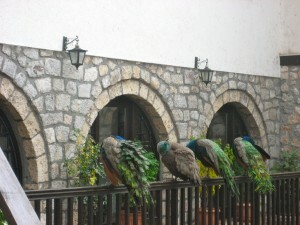 The Monastery on Lake Ohrid was quite beautiful and inside the grounds I was super excited to find several peacocks just roaming around. Unfortunately my camera battery died, but Charles got some really pretty photos. 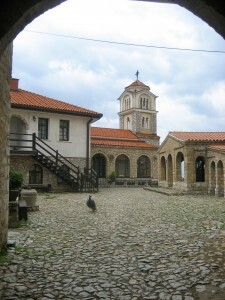 An avid traveler on the Lonely Planet forum suggested that we grab lunch at the Monastery Restaurant – which was quite lovely, upscale and yet surprisingly very cheap. It was also quite entertaining to walk into a place that had fine white table clothes with a huge backpack on. Since the Monastery is near the Albanian border we decided to walk we got half way when a bus stopped and offered us a ride to the border for 40 dinar each (that’s like 50 cents). So we hopped on and then walked across the border out of Macedonia and a half a mile up the road to Albania where we were greeted by a sign of the Albanian Flag with bullet holes in it. The Albanian border a little further up appeared to be under construction and they were checking passports out of trailers. I mentioned Pogradec to the border official, but Albanian doesn’t resemble Bulgarian and it was quite hard to communicate. Luckily I found someone who spoke Macedonian and he offered to drive us to Pogradec for 5 Euros, which I knew was too much, but it was already getting dark thanks to Daylight Saving time and we needed to find a ride from Pogradec to either Berati or Tirana. In Albania, they don’t have actual bus stations they have the “Furgon System,” which is basically several large vans that go to different cities around Albania. There is no schedule, they gather in one random area of a city or town (sometimes the location changes) and each Furgon will leave once they have enough passengers. I was extremely nervous about this system because not having a schedule is rather scary for me in general. So I tried my best to explain to our driver that we needed a Furgon to Berati or Tirana. When we entered Pogradec he seemed to know exactly where to go and even asked around and found us a Furgon going to Tirana. We hopped right out of the car and into the Furgon and we were on our way. Our Furgon was filled with college students on their way back to school. Most spoke very little English, but luckily one of them just so happened to be an English Major. At a rest stop he was very sweet and bought me a water since I didn’t have any Albanian money yet. I’m not quite sure how long the trip was – but it was definitely one of the worst rides of my life. One thing you need to understand about roads in the Balkans (Bulgaria included) is that they aren’t very well developed and most routes go over mountain ranges and hills causing even those who don’t get motion sickness to get a little carsick. Not only was I sick to my stomach and laying down most of the ride, but I was also severely congested and I guess that combined with the elevation completely popped my ears. So basically, my nose was running non-stop, I was nauseous and I could barely hear – every sound was completely muffled. We had no idea where the Furgon would drop us off and all we had was a mini-cartoon map of the area our hostel was in – so I gave Charles my flashlight and he started asking people if they could tell the driver to drop us off in a square mentioned on the map. The language barrier was quite apparent and Charles wasn’t getting anywhere until he got the attention of a new passenger who had her earphones on. Elona spoke English and said we should just get off with her – which we did. She then was kind enough to walk us to our hostel. 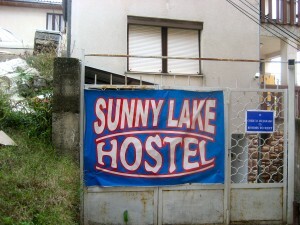 Home sweet home – Tirana Backpackers Hostel . . . I was just excited to have a bed to sleep in the next two nights. Keep in mind I was still really out of it and could barely hear a thing. I don’t even remember the conversation Charles and I had at dinner that night in Tirana and I took a Benedryl that night and passed out.